Yo kids, it's Saturday, and the freakin' weekend's a great time to check out some “ZWR in the Wild” action. 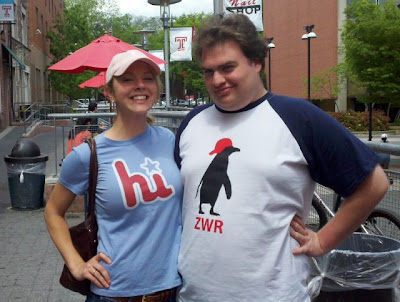 Below, super-famous Alex and her buddy Rudy proudly model their Hi and classic logo tees on North Broad. Which brings me to: Congratulations Temple University on being named the Official College of Zoo With Roy! You hear that, you donkeys at Penn, Drexel, Villanova, St. Joseph’s (PA), the University of Texas at Austin, Penn State, Northwestern, and Beaver? Temple owns the title... for now. That’s how it’s going to work. Last campus to be seen repping the penguin gets to be the official school of the bolg (and earns all that comes with that). “But ZWR, how can we get shirts?!?!!?! !” Dude, I have like 34 links on the bolg, and Alex’s picture is ginormous right next to this post. Seriously, no wonder Temple owns your weaksauce school. But yeah, also: everything’s still 15% off until Monday (the day after tomorrow) with the code ZWRBEER. Order now and you'll definitely have yours in time for The Fightins Tailgate 2011 (that scoreboard photojob so rules). So go buy eleven or more. You're just gonna do it drunk tonight anyway if you wait. BRB- gotta go fight, fight, fight, for the cherry and the white. the chick on the right is the same as the one in the picture? Graduating from Nova and headed to Temple, quite proud! Proud. Are there Owls in zoos? When I worked at the Zoo I used to care for the Owls and also take them out to ZOO Birthday Parties and the such. So yes, there are owls at zoos.